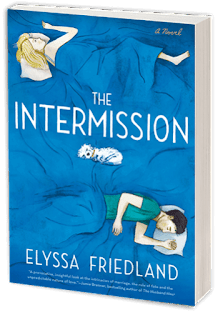 Elyssa Friedland is the author of the new novel The Intermission. 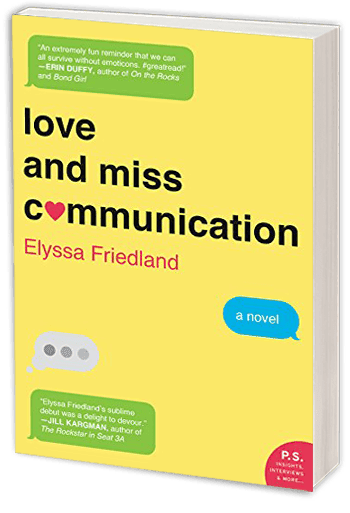 She also has written the novel Love and Miss Communication, and her work has appeared in a variety of publications, including Bustle and RealSimple.com. She lives in New York City. 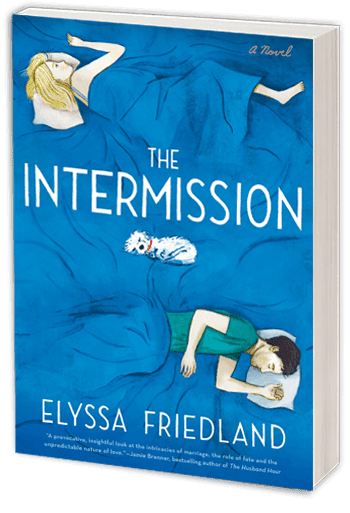 Q: You write in your acknowledgments that you came up with the idea for The Intermission while watching your husband load the dishwasher. How did that lead to this novel? A: It’s true. I was brainstorming ideas for my second novel and nothing was inspiring me. Then one day I was sitting at my kitchen counter and my husband went to load the dishwasher. Now I feel bad complaining about him because at least he does the dishes. But I will anyway. He lifted each dish from the sink and held in the air, analyzing its shape for a good five to ten seconds. Then he looked down at the dishwasher liked he’d never seen it before and contemplated for what felt like an eternity where to place the dish. And don’t get me started on what happened with an odd-shaped bowl! So I like to say The Intermission was born in my kitchen. Watching my husband load the dishes in a much more deliberate and cautious manner than I would caused me to reflect on marriage generally. Individuals have so many idiosyncrasies and no two people have the exact same way of thinking or come from identical backgrounds. And yet marriage is what our society proscribes. Two people with zero shared DNA are expected to cohabit and have children together. It’s a wonder it ever works! Q: The novel switches back and forth between Cass's and Jonathan's perspectives. Did you write the book in the order in which it appears, or did you focus more on one character first and then turn to the other? A: I wrote the book in order. I think in a very linear fashion so it was the only way I could imagine doing it. Especially with the alternating perspectives, it was important for me to capture events from both sides within a short time period. It’s part of what I think makes The Intermission interesting. 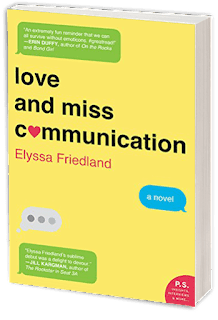 The reader gets to see many of the same scenes through the eyes of Cass and Jonathan and the differences are really eye opening and revealing about the characters. Q: The novel deals with secrets and the impact they have on a marriage. What intrigued you about this theme, and did you know how the novel would end before you started writing it? A: Who doesn’t love secrets? There are so many fascinating aspects of secrets: the original story, why it can’t be shared, what would happen if it came out. But my favorite aspect is the snowball effect of a secret. I think a lot of people keep things from each other – definitely spouses – out of an abundance of caution. They don’t want to be judged, especially during the dating phase. But then time rolls along and suddenly what felt like a minor omission at the time is a really big deal. Take for example lying to your partner about how many people you’ve slept with. You might be inclined to do that during the early phase of dating but then fast forward you’re in a committed relationship and there’s this lie hanging out there. When’s a good time to say: Hey, remember I told you I slept with four people? It’s actually twelve! Your partner will be upset you lied in the first place and wonder what else you’ve been dishonest about, even though it all started out innocently enough. Q: The book takes place in New York and Los Angeles--how important is setting to you in your work? A: I love writing about places I’m familiar with because I get to make my observations to the reader when I wouldn’t otherwise have a forum to share them. I have a million thoughts tunneling through my brain when I walk down the street and I need some expression for them. New York is my home and I could write a novel about each individual street corner there is so much happening here. And Los Angeles is my happy place where I love to vacation and visit on book tour. It’s this place where everyone is healthy and tan and nothing quite seems real. Why wouldn’t I want to write about that? A: I’m doing final edits on my third novel, which comes out next summer, but I can’t say more about the topic or themes yet. See – I love secrets! A: Read The Intermission. It’s juicy and twisty, I promise.